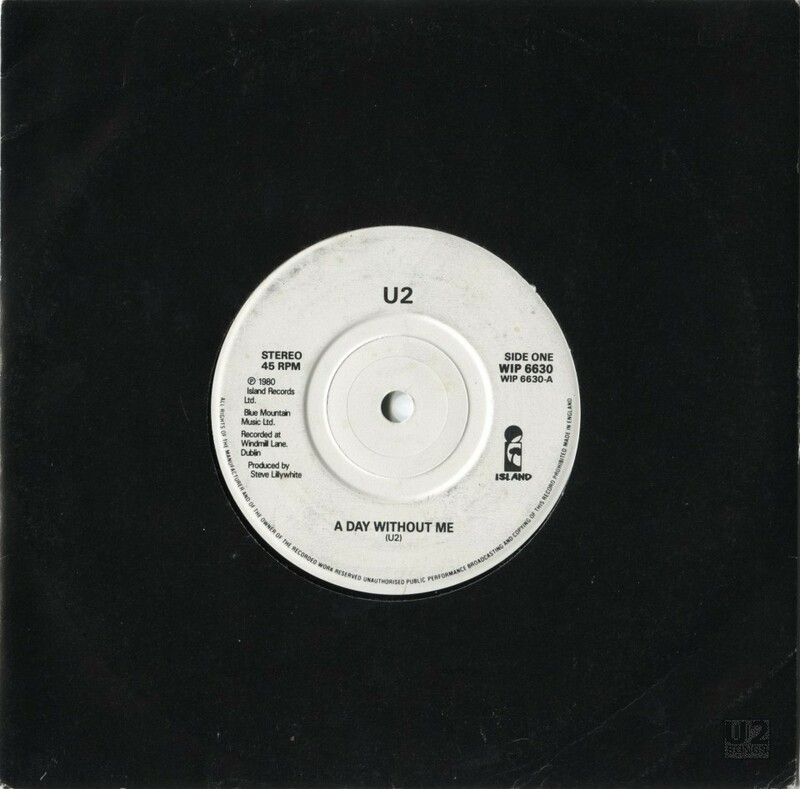 “A Day Without Me” was the second U2 single released by Island Records in the UK. The commercial release was August 18, 1980. As well as a commercial single, Island Records pressed a number of formats which were sent out as promotional items. These were sent out for use in juke boxes, and also for promotion at radio, and to reviewers. Typically the promotional items were quite similar to the commercial single. In the case of “A Day Without Me” the same track listing was used on the commercial single and the promotional singles. There were no unique edits or tracks to be found in the promotional singles for “A Day Without Me”. In France a number of commercial singles were stickered with a sticker that listed “Vente echantillon gratuit interdite” marking them as a promotional release. In the UK a different label was applied to these promotional singles, having a big “A” in the center of the label. These were sent out accompanied by press sheets, and would be sent either in a generic sleeve or in the commercial sleeve for the single. Copies destined for juke boxes were pressed with a silver label molded right into the vinyl. Produced by Steve Lillywhite. Written by U2. Recorded: Windmill Lane Studio, Dublin. Engineer: Paul Thomas. Photography: Susan Byrne. Design: Rapid Exteriors.